View of the town of Thurles, situated on the River Suir in County Tipperary, Ireland. Thurles derives its name from the Irish ‘Durlas Eile’ which translates as ‘strong fort of Ely’. This view depicts the main road through the town as well as the remains of a 15th century tower house. The towerhouse was built by the Butler family to replace an earlier motte castle and manor house. It served as the main garrison for the town and became known as Black castle. 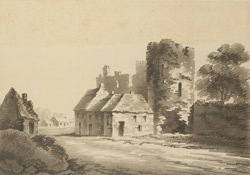 Another tower was built in the town, located at the lower end of what is now Main Street, to defend the bridge over the Suir River and the eastern entrance to the town. It became known as the Bridge Castle.